Ultra Cot'n Wash (Scent and Dye Free) cleans all cotton with no shrinking, no stretching and no fading. Ultra concentrated for a warm water wash. Safe to use on fine needlework as well as sweaters, baby clothes, towels, etc. 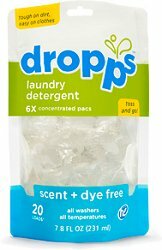 Cot'n Wash is now available in packages containing 20 pouches called Dropps. Each pouch has enough phosphate-freed, enzyme-free, 6x concentrated detergent to clean a full load of laundry. You'll need just as squirt or two in a basin of cold water to clean your needlework safely and effectively.